Just felt like posting some pictures of my sand area, because I am in love with sand play. 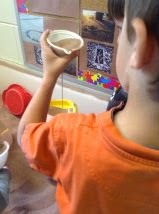 So much learning happens there from math: volume, measurement; to science: gravity, flow; and so, so much more. It's easy to make it something special. In order to make mine "local" I have added sand from a local beach, drift wood, and local sandstone rocks. For inspiration, I have pictures of rock formations like Stonehenge, as well as pictures of Andy Goldsworthy art up on the walls. Any suggestions? Let me know! If you get any inspiration, fill your boots!